Dinosaur lovers, this artful rendition of the Camarasaurus and Allosaurus will capture your attention at first glance and keep you looking to examine all of its glorious detail. This fine artist's depiction of the herd animal, Camarasaurus, entangled with the Allosaurus, a theropod, will surely delight dinosaur expert and novice alike. Josef Moravec, the renowned paleo-artist of the original oil from which this fine art print is done, has had his works displayed in Natural History Museums throughout Europe and North America. This Camarasaurus & Allosaurus art print is a prehistoric pin-up perfect for décor in any room, such as a child's bedroom or playroom, an office, garage or study as well as a classroom. More often than not, a dinosaur print sparks conversation about the size, types, magnitude and history of the creatures as well as appreciation for the art itself. Whether your style is fun and playful or focused on a love and appreciation for dinosaurs, this piece is engaging and artful all at once. 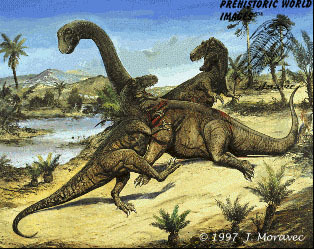 Low on intelligence and the smallest of the sauropods, the artist rendering of the Camarasaurus (of the Camarasauridae family of Jurassic dinosaurs and an herbivore) is realistically portrayed alongside the Allosaurus, known as the "wolf of the Jurassic" and carnivore in a setting that reflects the dry terrain offset by a generous watering hole lined with trees indigenous to a tropical locale. Framed or not, the Camarasaurus & Allosaurus art print will be a unique focal point of any room due to its dynamic nature and realistic appeal. The long neck and tail of the Camarasaurus stretches across the page such that one can almost imagine it easily swooping up to the tops of trees to devour the leaves it chomped with giant teeth to sustain its leafy diet. The name Camarasaurus is defined as "chambered lizard" due to the holes in its vertebrae. Also notable is that the Camarasaurus is one of the few Jurassic dinosaurs who's fossilized young have been found. Conversely, the Allosaurus was the primary meat eating dinosaur of the Jurassic, was an avid hunter and thought to travel and hunt in a pack. Feared by all herbivores, the Allosaurus was named for its lizard-like qualities and strong frame. It is hard to believe that these giant, intimidating dinosaurs are thought to have hatched from eggs and once ruled the open plains and vast expanses of North America. The fact that an imagined scene of what it may have looked like during that time is captured so realistically (down to the very claws of their gigantic feet) in this print is an exciting reason to own it. Displaying your very own dinosaur print is a great way to show off your artistic flair as well as historical knowledge of these fantastic beasts. And if you don't know anything about them, dinosaur art is a great way to elicit discussion and contemplation on a fascinating topic. This Camarasaurus & Allosaurus art print makes a great gift for Dad, grad, or the child, scientist or student who "has everything." Earth tones, a dynamic theme and the realism of these giant creatures make this an obvious choice for the hobbyist or herbivore in your life.